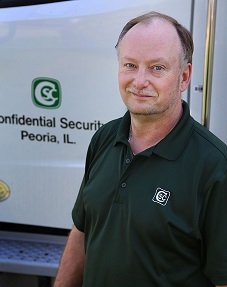 Established in Peoria in 1984 when the concept of commercial shredding in Central Illinois was virtually unknown, AAA Certified Confidential Security Corporation (CSC) shreds, disintegrates, and degausses confidential and proprietary information. 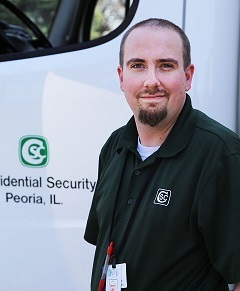 From a rented warehouse space and one truck, to a new destruction facility with state-of-the-art security; CSC has steadily grown over the years with the addition of five trucks to its fleet, upgraded shredding equipment, and new process equipment for the ever evolving electronic media trends. Confidential Security Corporation is committed to protecting and destroying confidential information according to NAID (National Association for Information Destruction) AAA Certification requirements. In addition to Peoria and Central Illinois we also service the following areas: Bloomington, Champaign, Danville, Decatur, East Peoria, Galesburg, LaSalle/Peru, Moline, Morton, Quad Cities, Quincy, Rock Island, and Springfield. Walk through our timeline and let us introduce you to CSC’s confidential shred services and the people that provide them.